A missing 11-year-old boy in India has been found after he was spotted by a member of the public who received a WhatsApp alert sent out by police. Police in the northern town of Bareilly say they used the instant messaging service to send out the boy's photo to several mobile phones in the area. A man travelling on a train, who had received the alert, recognised the boy sitting near him and called the police. India has more than 900 million mobile users and WhatsApp is hugely popular. The app, used by more than 400 million people globally every month, was bought by social networking site Facebook recently for $19bn (£12bn). WhatsApp is hugely popular in India because it is easy to use and carries no advertisements. The service is available on Apple, Android and Blackberry platforms and it's dirt cheap - for the first year a subscriber pays nothing and thereafter, only 55 rupees (90 cents; 54 pence) every year. India's two main political parties - the governing Congress party and the opposition BJP - are using WhatsApp to contact voters before the elections. Public relations executives routinely communicate with their clients on this app and police in several Indian cities informally use it to reach out to wider groups. 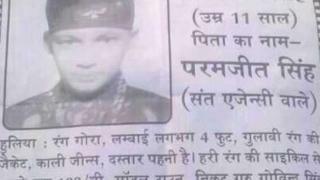 In the case of the missing boy in Bareilly, police took a photo of the pamphlet which had a picture of the boy and his father's contact details. It was sent by WhatsApp to the nearby police stations and the boy's family and relatives who then forwarded the message to everyone in their address books. Daanish, the man who spotted the boy on the train, received the Whatsapp from a friend known to the boy's father. "We used various ways to publicise the boy's story. We printed pamphlets and pasted them around Bareilly. We uploaded a digital copy of the poster on WhatsApp and sent it out as a chain message," senior police officer SP Singh told BBC Hindi's Tushar Banerjee. "By chance, the message reached the right person," he said. "The message reached Daanish who had boarded the Doon Express train from Moradabad town [90km or 56 miles from Bareilly]. He recognised the boy from his photo," Mr Singh added. The boy's father Paramjit Singh said his son had left home at around 0700 local time (0130 GMT) on Sunday for a ride on his bicycle, but did not return for many hours. "We called all our relatives and friends, but couldn't trace him. So we went to the police for help," he added. It is not clear how the child ended up on the train and police say they are investigating what happened during the hours that he left home and was finally traced, our correspondent says. There have been instances of families using social networking tools to trace missing people in other Indian cities too. Last month, another missing 11-year-old boy in Uttar Pradesh was traced to the Delhi railway station after his family publicised his case on Facebook and WhatsApp.